Beecher Mausoleum will celebrate its 100th birthday anniversary this year with a makeover of the venerable structure this summer, along with a party and theatrical presentations depicting the lives of some of those entombed there. Beecher Mausoleum Fall Festival 2014The Mausoleum, a Will County and National Historic Landmark, long has been in disrepair. But thanks to a generous offer from the United Union of Roofers, Waterproofers and Allied Workers, of Westchester; International Union of Bricklayers and Allied Craftworkers; and Pointers, Cleaners, and Caulkers of the International Union of Bricklayers and Allied Craftworkers, based in Elmhurst, in conjunction with Landmarks Illinois, preparation of the building’s repair soon will begin. Jack Tribbia, the president of Restoration Division of Berglund Construction Co. in Chicago, met with union representatives in Beecher this spring, as well as Berglund Logo 2965Cmembers of the Beecher Guardian Angel Association (BMGA), the group that is currently overseeing the mausoleum restoration project. Tribbia prepared a detailed scope of work, aimed toward repairing the building’s walls and roof in order to once again seal the building to a watertight condition. Care will be taken to preserve historical elements of the building in this initial phase of the Beecher Mausoleum’s repair. The work is expected to be undertaken this summer to late fall. Once the work is completed, a final phased plan for the building’s full restoration will be developed. Landmarks Illinois, the state’s non-profit advocacy voice for historic preservation, included the Beecher Mausoleum as one of two historic mausoleums on its annual statewide endangered historic places list in 2013. Meanwhile, plans are underway for a celebration to take place this fall. According to Sandra Thielman, the driving force behind restoration of the mausoleum, the party will honor the Beecher Mausoleum’s centennial, and, at the same time, it will also serve to thank the volunteers and donors who have given time, effort, labor, and generosity to the project. 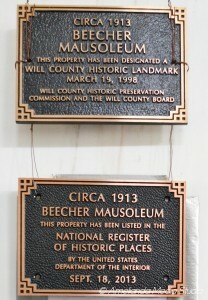 “Each of the souls inside the mausoleum once lived and thrived in the Beecher area,” Thielman noted. “They deserve to be remembered, despite a dwindling number of living relatives who can regularly visit their final resting places. Yet, it was largely these people who were responsible for shaping current events, just as today’s living will influence the future. Those interested in participating are asked to contact Sandra Thielman at sandra@beechermausoleum.org or call her at 800-713-9710 daytime or 815-728-8318 evenings and weekends.